The fifth and final Virgin Active Triathlon 'Secret Series' event took place last week in London - the Skechers Performance Secret Run. 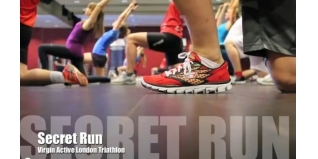 These training events - by invitation only to competition winners - featured some of the world's most talented athletes to get Virgin Active London Triathlon competitors in shape for the big event in this weekend. The Secret Run featured 2012 Olympian Lucy Hall and 2012 Paralympian Sophia Warner - you can see our interviews with both HERE - giving a great insight into their experiences of an amazing sporting summer - as well as helping participants to improve their running technique and speed too. We also spoke to Will Cheung from Skechers about their GOrun ride - which you will be able to sample at the London Triathlon Expo this weekend. Check the links at the bottom of this article to revisit all five of the Secret Series events.